Discussion in 'Reviews and Tests' started by RGiskardR, Feb 23, 2018. Appendix 1: SAP Account Portal. maoxu, revC0de, jerzy6012.50 and 4 others like this. Appendix 2: SecureAPlus Beta for Android Systems. Android Device: BQ AquiarisM10HD tablet. Updated UI with animated icons. maoxu, revC0de, jerzy6012.50 and 5 others like this. Appendix 3: Contacting to SAP Support. They offered me to try a new beta version of SAP with ClamAV engine already updated, but finally I decided to stay with stable one until the new official and stable SAP version is released (19th of February). Bugs fixed: Fixed "File index service is not ready" issue in the Universal AV scanning. Modifications: Take disk and CPU usage as consideration before starting Universal AV auto full system scan upon boot-up. Universal AV will wait until the disk and CPU usage low enough before starts its auto full system scan after boot-up. Previously only CPU usage was used as the parameter. Clean interface and easy accessing to most of the settings. Interesting and powerful combination of Application WhiteListing + Multi Cloud Engine + OffLine AV. Very Strong LockDown Mode (good to lock systems for average/standard users disabling warnings/notifications). Running a combo with a 3rd party main security solution disabling SAP UAV and SAP offline AV, to use the "anti-exe/lockdown" strong capabilities of SAP could be a great solution/alternative. Great Interactive Mode for advance users, but probably too much “user dependent” for average/standard ones. Strong Prevention options and flexibility even to enhance it, adding our own rules via WhiteListing Settings. SAP Universal AV -> Send to Server feature: takes long (even with a supposed priority of Premium License) to scan/get the results. Sometimes more than 2 minutes for just 1 file, this can be applicable to Interactive warning setting (Send to Server) and during on demand scans. Default and free ClamAV offline engine not so powerful, I almost didn't get any detection from it. To have an independent window to be resizeable in: Quarantine and History Reports. To have an independent window to be resizeable in: Application Whitelisting -> Command Line Settings -> while adding Rules. In Login Account user/password in SAP Account -> user/password data is not remembered for long, very annoying to re-type in any new Windows session, by design or? Speed up the upload/check/get detection results from Cloud UniversalAV multi engine. In general I liked so much the product, specially loved the power of WhiteListing + LockDown Mode and their settings , also the Interactive Mode (default), but on the other hand there are some aspects that should be improved such as the delay to scan and get results from SAP UAV Cloud multi engine. I would dare say that some of the engines are useless, and in this case the number is not so important but the quality and reliability of them. It's a good product to run a combo with a free antivirus and strength the prevention of the system via SAP WhiteListing + LockDown Mode. revC0de, jerzy6012.50, wwd and 5 others like this. YEAH!!!! Thanks so much for this review! You nailed this one! revC0de, Danyboy Hidalgo, grr and 4 others like this. It was a pleasure to read with those breaks in between, and a lot to see and to explore with all that screenshots! The product did really shine! Even if cloud scan is to be speed up, the whitelisting module has clearly cut the edge! The cleanup / rollback feature suggestion is a very good one IMO! Still many products do not offer that on their own. Interesting is also the differences you mentioned between VT online detections and SAP detections. 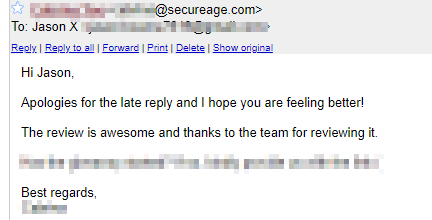 Great to see their support is so fast to reply! This is one very important aspect for me deciding on a product. I look forward to them to take care of your suggestions, they sure will, now as you provided them and us such a great in depth-review! Thank you for sharing, it must have taken you ages! revC0de, Trim, jasonX and 1 other person like this. revC0de, jasonX, Danyboy Hidalgo and 4 others like this. revC0de, silversurfer, Der.Reisende and 2 others like this. great review of this excellent program. a large contribution of work and it praises, perfectly. revC0de, jasonX, Der.Reisende and 2 others like this. Thanks to you RGiskardR and the MTAC team who have always been supportive of the "Reviews Section" (in lieu of BC2Tweak). Yeah RGiskardR you the man! revC0de, silversurfer and Der.Reisende like this. Fantastic review and really a lot of work and commitment @RGiskardR for a very good and customizable product. grr, Trim, silversurfer and 2 others like this. I like the way you presented all aspects in your review! I will use this as guide when I win a license! Thanks! revC0de, Der.Reisende, Trim and 2 others like this.